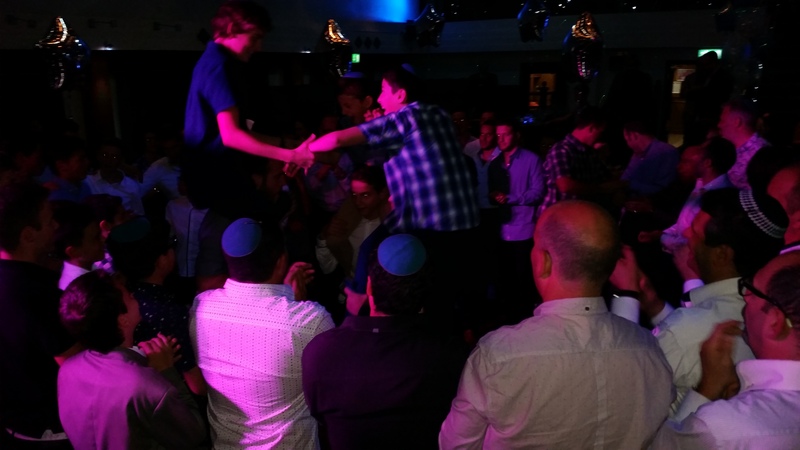 Great night celebrating Eytan’s Bar Mitzvah at the Hough End Centre! (Greater Manchester Police sports & social club). The GMP club in Chorlton has a large function room capable of hosting parties for up to 250 guests. Eytan’s parents, Mr & Mrs Edelmann, booked our popular party DJ Andy B for the evening event. Andy has a lot of experience with Bar & Bat Mitzvah’s, playing for many each year. His full mobile DJ rig consists of a top quality sound system (as appropriate for the size of your party), a selection of lighting effects plus star booth. This can comfortably cater for larger parties with over 200 guests for example. He carries a comprehensive selection of music & will be able to cater for most requests on the night, which is something he actively encourages. Beforehand, you can go through specific requests for the evening (as well as any you don’t want playing!). At this point, you could prepare a whole set list if required. You can have as much pre event communication as required to ensure we get it just right on the night. As well as the disco, Andy will also act as the host for the evening if required – making any announcements, introducing the speeches etc. He’s there all night & will fit in with how you want your evening to run. But if you do want any suggestions for timings etc, you’re welcome to have a chat with him about it. A typical Bar Mitzvah would open with the dancing mentioned above, then food, followed by speeches & party time to finish with. As well as the disco lights, we can also provide uplighters around the venue to help create the atmosphere, these are £14 each or £120 for 12. We set them up at the same time as the disco & can set them to your preferred colour. For an accurate quote, please be sure to mention the date, venue details & approx. timings.